Eclipse Shade is excited to Announce that we now offer retractable awnings in addition to our other styles. Retractable Awnings can offer all the benefits of stationary awnings while giving you flexibility in how to best use your outdoor space. You can extend your retractable awning to shield you home and family from the glaring sun and UV rays on the brightest days, while still having the option of enjoying natural light on cooler days. Protective Hood protects your awning while in the retracted position and gives your exterior a polished and finished look. Wind Sensors provided protection by signalling the motor to retract your awning in windy conditions. Sunbrella fabrics carry the Skin Cancer Foundations’s Seal of Recommendation. 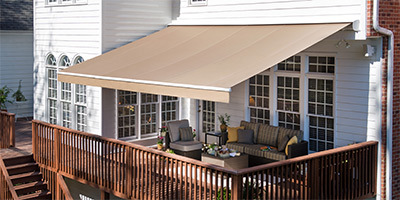 Sunbrella is durable with the protection you need from the sun. It is UV, stain, and fade resistant and has minimal shrinkage or stretching.